The Global Volcanism Program has no activity reports for Eagle Lake Field. The Global Volcanism Program has no Weekly Reports available for Eagle Lake Field. The Global Volcanism Program has no Bulletin Reports available for Eagle Lake Field. 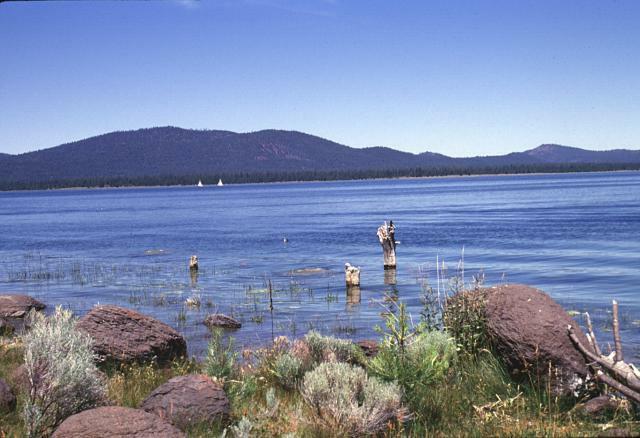 The Eagle Lake volcanic field occupies the junction of the Cascades, Sierra Nevada, and Basin and Range geologic provinces, and consists of 15 cinder cones and basaltic lava flow vents within a larger Quaternary basaltic field. The vents are aligned along faults defining the Eagle Lake volcano-tectonic depression, and are the southernmost example of late Quaternary back-arc spreading in the NW Great Basin. The Brockman Flat lava flow, the largest of the younger flows, was erupted from a N-S oriented 3-km-long fissure vent along a fault that forms the west boundary of the Eagle Lake basin and created an approximately 63 km2 tube-fed flow field that extended across the Eagle Lake basin to the east side of Eagle Lake. Miller (1989) mapped four Holocene centers west of Eagle Lake; however, recent 40Ar/39Ar dating indicates that the youngest lava flows were erupted during a relatively short interval between about 130 and 125 ka that was unlikely to span more than a few thousand years (Clynne et al., 2017). Clynne M A, Calvert A T, Champion D E, Muffler L J P, Sawlan M G, and Downs D T, 2017. Age of the Youngest Volcanism at Eagle Lake, Northeastern California—40Ar/39Ar and Paleomagnetic Results. U S Geol Surv Open-File Report, 2017-1027, 24 p.
Sawlan M G, Smith J G, 2014. (pers. comm.). The Global Volcanism Program is not aware of any Holocene eruptions from Eagle Lake Field. If this volcano has had large eruptions (VEI >= 4) prior to 10,000 years ago, information might be found on the Eagle Lake Field page in the LaMEVE (Large Magnitude Explosive Volcanic Eruptions) database, a part of the Volcano Global Risk Identification and Analysis Project (VOGRIPA). There is no Deformation History data available for Eagle Lake Field. There is no Emissions History data available for Eagle Lake Field. The Global Volcanism Program has no photographs available for Eagle Lake Field. There are no samples for Eagle Lake Field in the Smithsonian's NMNH Department of Mineral Sciences Rock and Ore collection. IRIS seismic stations/networks Incorporated Research Institutions for Seismology (IRIS) Data Services map showing the location of seismic stations from all available networks (permanent or temporary) within a radius of 0.18° (about 20 km at mid-latitudes) from the given location of Eagle Lake Field. Users can customize a variety of filters and options in the left panel. Note that if there are no stations are known the map will default to show the entire world with a "No data matched request" error notice. Large Eruptions of Eagle Lake Field Information about large Quaternary eruptions (VEI >= 4) is cataloged in the Large Magnitude Explosive Volcanic Eruptions (LaMEVE) database of the Volcano Global Risk Identification and Analysis Project (VOGRIPA).